DSC01412, originally uploaded by Luis XII. In case of the link is not available, I copied the article as you can find below. Thank you. Jakarta is not only Indonesia’s capital and most dynamic city, it is also beset with a plethora of 21st century urban problems. As its population grows, its green spaces shrink. In the first half of the twentieth century Batavia, colonial capital of the Netherlands East Indies, was a small urban area with approximately 150,000 residents. Batavia has become Jakarta, Indonesia’s megacity of 14 million. Green spaces in the city have shrunk along with this leap in population. As recently as 1965, green areas made up more than 35 per cent of Jakarta’s land area. Currently, they account for only 9.3 per cent, far below the target of 30 per cent set by Law No 26 of 2007 on Spatial Planning. As Jakarta is certain to continue to grow, the city’s master plan to protect remaining green spaces and add some more, especially along riversides, offer some hope. The city’s current 2000-2010 master plan aims to achieve green areas (legally defined as areas where plants can grow) of 13.94 per cent of the total city area. This is an excellent goal, but it is modest when we compare it to similar plans in the past. The 1965-1985 master plan, for example, planned for green areas covering 27.6 per cent of Jakarta’s land area. In part, these plans are simply catching up with reality. New luxury homes, condominiums, shopping malls, hotels, commercial buildings and offices have proliferated in Jakarta over the last three decades. Many have been built at the expense of green areas and have paved over water catchment areas, making the city more prone to floods. areas in the capital – and to create new ones. Not surprisingly, annual floods are becoming more severe, and more deadly. The worst flood in memory occurred in February 2007, inundating about 70 per cent of the city. It killed at least 57 people and sent some 450,000 fleeing their homes. 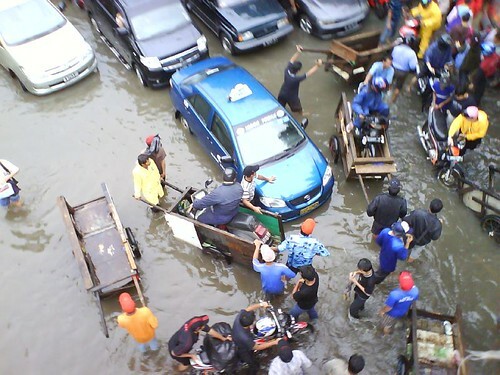 In the aftermath of the flood, Environment Minister Rachmat Witoelar put the blame on excessive construction of residential and commercial buildings, which now cover many of the city’s former green areas. Annual floods in Jakarta point to an urgent need to protect existing green areas in the capital – and to create new ones. Green areas absorb rainwater and thus help prevent flooding. Green areas also help make cities more sustainable and livable. Canal - Jakarta, originally uploaded by pyjama. As part of its master plan, Jakarta’s administration has planned to expand the city’s green areas to nearly 14 percent of the city’s area by next year. However, even this modest expansion will come at the expense of some of Jakarta’s most powerless residents. Often, when the city government creates new green spaces it does so by evicting the city’s poor residents and operators of informal sector businesses. For example, the restoration of Ayodia Park (on Jalan Barito in South Jakarta) led to evictions of fish and flower traders in January 2008. Many of the traders had run their businesses in that area for more than 20 years, yet Jakarta Governor Fauzi Bowo argued that the vendors were there illegally and had no right to the land. In February 2008, the city administration evicted ceramics sellers from beneath a highway overpass in Rawasari, Central Jakarta, in order to expand green spaces. It did the same to about 1400 families who had lived for years in Kampung Bayam (North Jakarta) in August 2008. In this case the aim was to restore the 66 hectare BMW Park (BMW in this case stands for Bersih, Manusiawi, dan Wibawa – Clean, Humane, and Esteemed). The Kampung Bayam eviction turned into a melee as many squatters, mostly women and children, resisted officers’ efforts to remove them. While Jakarta authorities often use force to ‘free’ land used by the city’s poor, they lack the courage to prevent construction of the condominiums, malls, hotels and commercial or offices that developers and the rich build in designated green areas in blatant violation of the city’s spatial plans. The Indonesian Forum for the Environment (WALHI) counted numerous Jakarta developments that converted green areas into malls and other commercial buildings, in violation of Jakarta’s spatial plan. 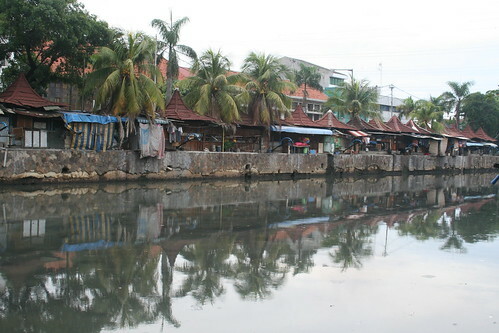 WALHI’s May 2009 report identified these illegal developments in Kelapa Gading, Pantai Kapuk, Sunter, Senayan, and Tomang. Governor Fauzi Bowo told the media in February 2008 that it would not be realistic to demolish such buildings to restore green spaces. Jakarta now has about 60 mid-size and large shopping malls. According to the Urban Poor Consortium (http://www.urbanpoor.or.id/ ), a Jakarta advocacy organisation, only about 500,000 Jakarta residents can afford to shop in those malls. The malls do not serve Jakarta’s poor, who outnumber Jakarta’s mall-shopping rich by seven-to-one. Not only has the Jakarta government failed to prevent the loss of existing green spaces to malls and commercial buildings, influential commercial interests have also scuttled plans to re-establish green spaces. For example, in March 2008, Jakarta’s City Council rejected the Jakarta Parks Agency’s plan to create green spaces in place of 29 gas stations, caving in to the demands of the politically powerful gas station owners. The city administration deserves support for planning to create additional green spaces.But it should not do so by mistreating poor people and the informal sector. It seems that Jakarta politicians find it easier to expand green areas by demolishing poor residents’ homes and forcing informal sector workers off public space, than by preventing, stopping, or demolishing developments that benefit only the wealthy. It was very interesting for me to read this article. Thanks for it. I like such topics and anything connected to them. I definitely want to read more on that blog soon.